::A&A:: NEW!! Don't give up Scroll, a photo by Alliana Petunia on Flickr. 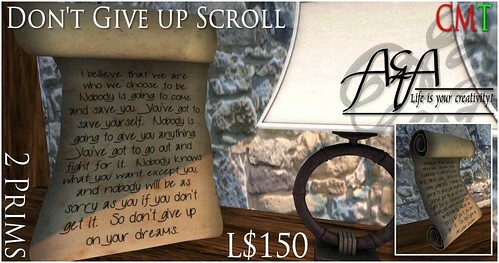 An inspirational scroll reminding us that everyday is a personal fight. A fight for the things we believe in and all the wonderful people we have in our lives. Nothing worth having is ever just handed to us. Don't give up on your dreams.